My job often comes with unique challenges and unexpected learning opportunities. Recently we were approached by one of our vendors and asked whether we'd like to know how to key/rekey locks. I have to say that having rekeyed a half dozen locks now I have a lot less respect for the security of my front door. 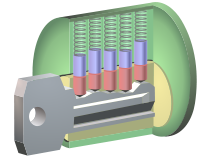 If you're interested in how a pin tumber lock works then read wikipedia as it explains it well. It doesn't look that complicated (it isn't that complicated!) but the first time you see a bump key in action you realize how easy it is to get into a lock. Putting that a different way, I buggered up the middle pin of a lock that I was rekeying at work the other day. In about three seconds with a bump key the lock was opened and I was able to fix it. Granted, there are more sophisticated bump resistant locks on the market (i.e. different tensions of springs on the individual cylinders) and really you should have home monitoring or an alarm system anyways but any illusion that a lock would hold a motivated person out is nonsense.